If the Performance Improvement Planning phase determined the need for one or more process improvement projects, the first step is to make sure you clarify the scope of the work ahead. Since you probably don’t want to shut down the business to overhaul everything at once, and since resources always are limited, the first challenge is to set priorities—determine which processes to improve and in what sequence. Does it start with engineering for customization? Does it end once the customer receives the products? Or does it end when the customer pays you? Identify critical process issues—translate CBIs from Phase 1 into one or more critical process issues. Create functional relationship map to identify functional dependencies. Establish project goals—these define “success” for the project so they should very specific, usually containing actual decrease or increase percentages. Define project roles—who will be on the lead the teams, be on them, and serve as resources. Develop a project plan for Process Analysis and Design—includes a timetable for activities and a tactical plan for the project (who is going to do what by when). 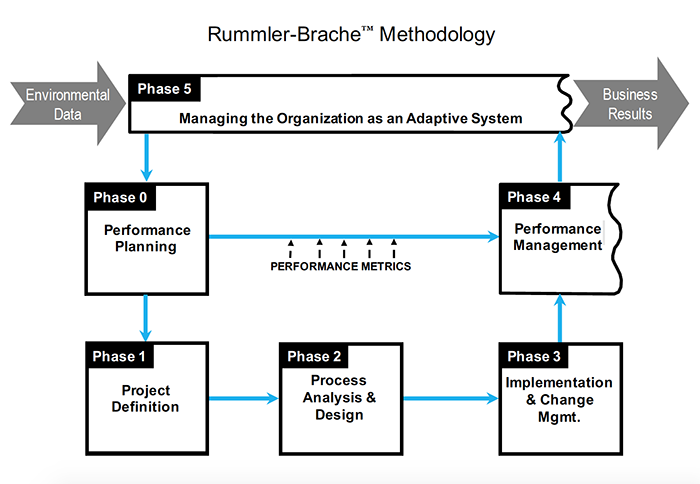 Orient participants in the Rummler-Brache methodology—provide training and specifics about the project. The output from Process Improvement Project Definition is the completed project scope.